14. You can also create recipes, cocktails, or “mocktails” based on fictional characters you love from a TV show, book series, or movie…especially if you’re writing something in a similar vein. This entry was posted in ebook, Publishing and tagged bloggin ideas, Blogging, book ideas, creative writing, Daily Writing Tips, DailyWritingTips, story ideas, writing career, writing goals, writing tips on March 14, 2019 by First Edition Design Publishing. Feel free to use any of these story ideas. Transpose them into different genres, and replace words or clauses to generate even more stories. This entry was posted in ebook, Publishing and tagged Daily Writing Tips, DailyWritingTips, editing tips, story, story ideas, tips, writing career, writing goals, writing practice, writing tips on December 20, 2018 by First Edition Design Publishing. No, this is not a how-to for creating fake news. It’s a prompt that opens a never-ending well of ideas for any fiction writer. I’m talking about how to get story ideas from headlines in the news. Try it out today and see what happens! A few years ago, I read a startling headline in a back section of the Sunday newspaper. It said “Man Likely Padlocked Himself in Bag Found in Bathtub.” I blinked twice, sure I had misread something. Even after I read the article, I still couldn’t believe it. I was grieved for his family and friends, but I couldn’t help but see the possibilities for inspiring fiction. I wondered how it could even be done? As a claustrophobic, I wondered, why? This situation and article were surely stranger than fiction, but it prompted so many questions. Turns out questions are at the heart of great fiction, and you can use headlines to develop ideas all day long. Here’s how to get story ideas from the strangest news headlines. The first step in how to get story ideas from headlines? Look for headlines. Find a newspaper and scan through the headlines. You don’t have to read entire articles to find inspiration from their titles. I have found that for fiction, I prefer to search anywhere but the front page. I usually know too much already about the events that make the front page, and I’m after something that prompts new questions, ideas, and worlds. Family Car Parked at Charlotte Douglas [Airport] Was Filled with Ants. They Want an Explanation. I found all of these headlines in about five minutes by looking up regional or state newspapers and clicking on the “local” tab. Once I find a few headlines that scream for exploration, I make a list of the questions one prompts. Again, I spend no time reading the article; I’m only mining the headline for ideas. Here are some questions I wrote down for my headlines above. Workers Unearth Mystery Buried in SC School: The wording of this headline fascinates me. Buried IN school? Like inside a wall? What were they digging up? Were children present? What is the mystery? Who will solve it? Is it valuable and might need protection? Is it linked to an old legend or cold case? For the parent brawl, I want to know about the relationships. Who started it? Was it between parents on the same team? Was it a mixed group of men and women? Who broke it up? How much irony can you pack in one scene where adults fight while kids shake hands? Once you have a good set of questions for several headlines, choose the one that is most compelling. Some of my example headlines lend themselves easily to certain genres. The “mystery unearthed” might well be mystery, suspense, or horror. The ants could be science fiction or magical realism (Did anyone else think of Gabriel Garcia Marquez’s ants from One Hundred Years of Solitude when you read that headline?). The parent brawl might be realistic fiction or the beginning of a crime fiction piece. Identifying genre can be a short-cut to creating fresh ideas, simply because you can flip or twist what is expected. What if the mystery unearthed isn’t suspense but a romance? What if the car full of ants becomes a witty children’s book instead of the horror story it appears to be? Maybe the parent brawl isn’t the beginning of a true crime tale but the opening to a space opera story where irony beams people into an antigravitational state. (I think I might have gone too far on that last one — I’m out of my depth). Once you have those questions and a possible genre, identify your main character and give them a strong goal. Throw things in the way of getting what they want, and force them to act. The story might go somewhere completely unexpected, but that’s the fun! I’ve had students write two to three stories in different genres using the same headline to show them how inspiration can go anywhere they want. Oh, and the guy in the duffle bag? Turns out he was a spy, but they reported he did indeed lock himself in the bag. Hmmm . . . I have a few questions. Real life might be stranger than fiction, but it certainly doesn’t disappoint when you are looking for story ideas. Have you ever read any headlines that inspired a story? Share in the comments. This entry was posted in ebook, Publishing and tagged Daily Writing Tips, DailyWritingTips, editing tips, Headline, ideas, News, story ideas, tips, writing, writing tips on October 9, 2018 by First Edition Design Publishing. This entry was posted in ebook, Publishing and tagged Daily Writing Tips, DailyWritingTips, editing tips, story, story ideas, Storyline, Storytelling, tips, writing career, writing tips on August 28, 2018 by First Edition Design Publishing. It is Short Story Africa Day on 21 June each year! It is the shortest day in the southern hemisphere. To celebrate, we’re sharing ways to find ideas for your stories. If you are a short story writer and you’re looking for a quick fix, try one of these. Choose a date. What song was number one on that day? Do some research about the song. Who wrote it? Why did they write it? Who inspired it? Use what you find out as inspiration for your short story. Sign up for a daily writing prompt. Follow people who share them on social media. ‘A prompt can be anything. A word, a line from a poem or a song, a name or even a picture. Anything that gets you writing. Find ones you enjoy.’ (via) Your daily prompt could inspire your short story. Take a fairy take and write it as a modern day story. Change the sexes of the main characters. Choose a random setting. 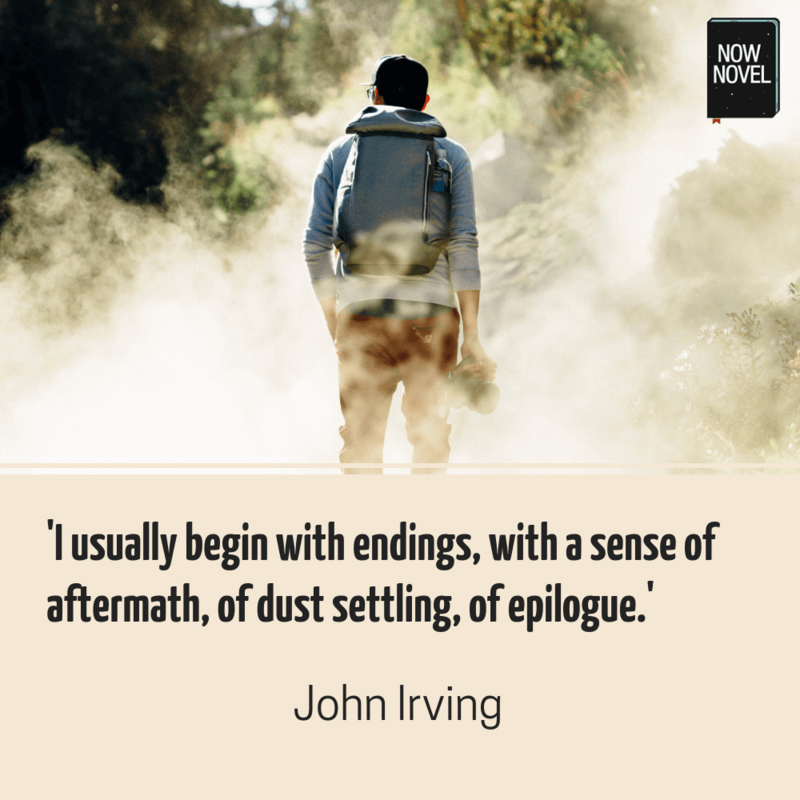 If the tale is too long for a short story, write the beginning or ending as your short story. A myth is an ancient story involving supernatural beings, ancestors, or heroes. It is used to explain aspects of the natural world or to show the psychology, customs, or ideals of a society. Examples: The Myth of Creation, Arthur and Camelot, The Rain Queen. Write a myth using one of our 20 Myth Prompts as a short story. Find one thing that interests you. Keep a file and save these items in it. It can be in a photograph or something you’ve heard. Research it and use it as inspiration for a story. Use this random first line generator to start your story. Choose a topic that interests you. Visit Instagram and click on a hashtag related to the topic. Look at the posts and choose an image that inspires a story. Use this ‘What if?’ generator to enhance your scenario. If you have a social media following, ask your fans what they want you to write about. Create a poll of some of the ideas you get and write about the one that gets the most votes. Use easypolls or pollcode or pollmaker. Use the embed code to share it on your blog or link it to your social media platform. Which public holiday is next on the calendar. Write a short story about someone who is planning for this holiday, or a story that centres around the holiday in some way. Rewrite the story of your parent’s first meeting. Write it from the perspective of a stranger watching them. Change names, swap the sexes of the characters, change locations. Go! This entry was posted in ebook, Publishing and tagged book ideas, Daily Writing Tips, DailyWritingTips, editing tips, fiction, fix, ideas, short stories, story, story ideas, Storyline, Storytelling, tips, writer, writers, Writers Write, writing, writing career, writing tips, writing tools on June 25, 2018 by First Edition Design Publishing. She wasn’t kidding. The End. And they all died unhappily ever after. And I know how she felt because when I was in Junior High I read a novel about hot rodders where, at the end, the hero drives off a bridge, his head collides with his girlfriend’s with a “bone-shattering crunch.” The End. I felt cheated. I went back and read the end again. Yep. Dead as can be. Let that be a lesson to you kids — no racing around in souped-up jalopies. Let’s talk about what most of us do, and that’s genre fiction. Let’s talk about “. . . and they all died.” Maybe indulge in a little compare and contrast between tales that do not end with everybody dying, that say, yes, Virginia, happiness is possible. Meme Number One — grim stories about the futility of modern life are more true-to-life and realistic because the world is going to Hell in a hand basket. Meme Number Two — stories about miserable characters trapped in meaningless lives who stay miserable and do nothing about it are somehow more important than a series of paranormal romances. At their dark, bleeding hearts these memes would have you believe that a happy ending is easier to write, and therefore less worthy. “He stood over the heroine’s body, holding the knife, laughed maniacally and went back to the castle.” That Stephanie Plum is less valuable to readers than the woman at the heart of Gone Girl. If it is, people have been saying that for generations. In Invasion of the Body Snatchers (1955) starring Kevin McCarthy, the hero talks to a psychiatrist about the people in Santa Mira who believe their friends or family members have been replaced by doubles. The shrink replies, “It’s mass hysteria. Worry about what’s going on in the world, probably.” That was 1955 and we’re still here. Remember the kids driving their hot rod off a bridge? First it was juvenile delinquents, then hot rodders, followed by surfers, then hippies and later, slackers, each iteration of youth marking the end of civilization as we know it. If anything, the Jayne Ann Krentz ending, with relatively happy protagonists, is more realistic because we’re still here; Charon is still waiting to take that hand basket across the River Styx. That’s right, almost one in three books, including e-books, has a lady with cleavage, or a guy on the cover who makes me feel inadequate. Add in thrillers and mysteries and it’s over half of everything sold. That number has held steady for years, and to me that says something. It says that a good story can end happily, and that such stories fill an important need. 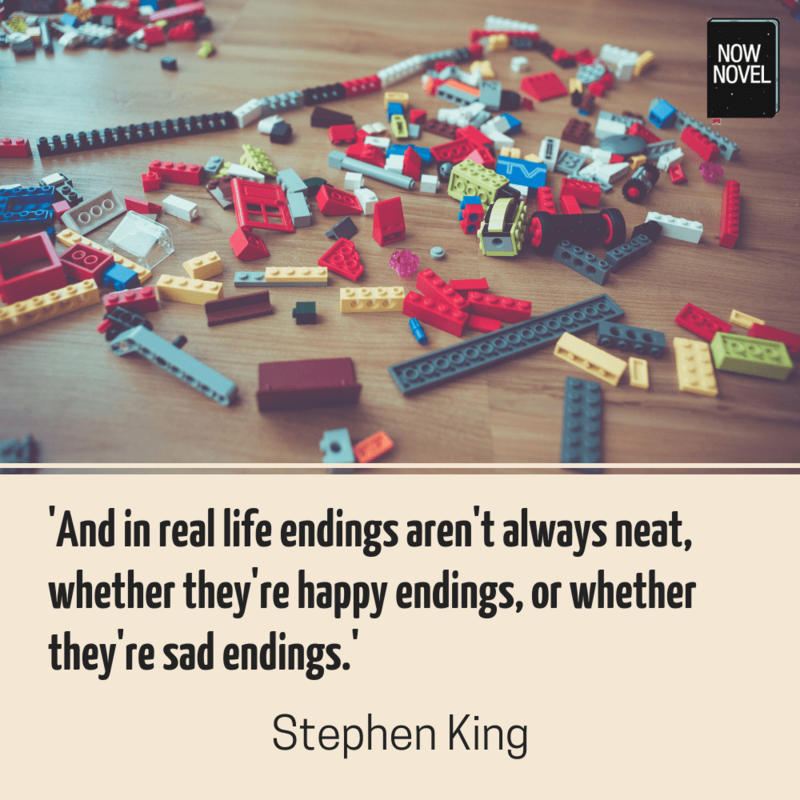 Note that here I am including a typical Stephen King ending where victory is obtained, but at a cost. This attitude isn’t new, either. Barbara Tuchman’s brilliant The Guns of August was praised, sort of, by scholars as “popular history.”2 It was an instant best seller and continues to sell to this day. I believe in Story. I believe in laughter. For my money there’s not enough of either one in the world. First, Story, with a capital S.
The world around us is often chaotic, we humans have a hard time figuring out why things happen and often the answer is simply, “because.” The cliche of the woman holding the body of her husband and shrieking at the heavens, “Why? Why?” is constructed like a flawed pearl around a pebble of wisdom, because often the answer is — just because. Our job is to layer on structure, to remove the extraneous. (And as a side note, wouldn’t that be a good topic for one of these essays? Do we as storytellers create the structure, or is it always there, waiting for us to reveal it? In a possibly apocryphal story Michelangelo once said the statue was always in the piece of marble; he just had to chip away the part that wasn’t David.) We either make or reveal the structure, and provide a tale to entertain. Humor, happiness, is hard! You want tragedy? Just open your AP news feed. Jerry Lewis said in the documentary “No Apologies,” “I see people all over the world desperate for laughter.”3 He was right, and I would add to that they are desperate for simple joy. Here’s the point. It’s important how you feel about your work, and if you’re writing a series about a shape-shifting alien prince, or a detective who indulges in self-deprecating humor, you may feel a nagging sense that literary writers are somehow “better.” Fight it. In the final analysis, what I’ve always wanted to do is what Don McLean says in, “Bye, Bye, Miss American Pie” — “maybe they’d be happy for a while.” What I’ve learned, no, what has been driven home to me recently, is just how important that is. This entry was posted in ebook, Publishing and tagged creative writing, Daily Writing Tips, DailyWritingTips, improve your writing, improving your writing, story, story ideas, Storyline, Storytelling, Write Practice, writers, Writers Write, writing, writing career, writing goals, writing practice, writing tips, writing tools on April 2, 2018 by First Edition Design Publishing. This entry was posted in ebook, Publishing and tagged creative writing, improve your writing, story ideas, Storyline, Storytelling, Writers Write, writing, writing career, writing tips, writing tools on March 27, 2018 by First Edition Design Publishing.